BETAWe're testing a new design on this page. You can give us your feedback in our feedback form below. 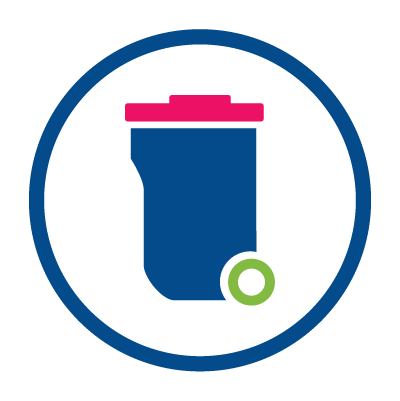 You can find your bin day through our online form. We have different types of bins to help get rid of the day to day waste build up. Your black wheelie bin/sacks is for rubbish that can’t be recycled and is collected fortnightly. Please leave your bin/sacks for collection on the boundary of your property for 7am on collection day. Your green wheelie bin is for recycling and is collected fortnightly. Please make sure you put the items in the bin loose, without plastic bags or sacks. Please leave your bin/box for collection on the boundary of your property for 7am on collection day. Your food waste bin is collected every week. Please leave your bin for collection on the boundary of your property for 7am on collection day. You can put any raw or cooked food in your caddy and can even scrap uneaten food straight into it. Garden bins are collected fortnightly. Please leave your bin for collection on the boundary of your property for 7am on collection day. Please note: We will not be able be able to take your bin if it is too heavy for the crew to move safely, or if the collection vehicle can't pick it up. Textiles are collected on your recycling collection day. These should fit into a carrier bag and put next to your green recycling bin. We can't accept pillows or duvets or any items in black sacks or charity bags. Small electrical items will be collected on your rubbish collection day. The items should fit into a carrier bag and put next to your black rubbish bin. We can't accept televisions, computer monitors or any items that won't fit into a standard sized carrier bag. Batteries will be collected on your rubbish collection day. They should be placed in a sandwich bag on the closed lid of your bin. Unfortunately, we can't accept car batteries. If you're moving house, please don't take your bins with you. If you're in a new home please contact your developer or managing agent as they should provide the bins for you. If you have a garden bin, you can take it with you. You'll need to let us know that you've done so by completing our online form. If your bin wasn't collected, you can report it using our online form. Please ensure you report it within 48 hours.